Approximately 227kms south of Perth, Margaret River is famous for two things - its wineries and its surf. The town is home to many world-renowned wineries such as Cape Mentelle, Leeuwin Estate, Vasse Felix, Voyager Estate and Redgate, as well as some up- and-coming establishments such as Howard Park. There are plenty of water activities such as fishing, scuba diving and boating. Other attractions include bush walking, abseiling, horse riding, caves, historic sites, museums, forests and wildflowers. Margaret River is also a popular place for artists and there are many galleries and craft shops in the area. The real beauty about the town of Margaret River is that, although it lies among lush green forests and farming land, it is only 10kms from the Southern Ocean. Pemberton is best known for its beautiful forests. Located 335kms south of Perth, it is a major timber mill town and boasts the largest sawmill in the Southern Hemisphere. Pemberton's forests are well-known for their Karri, Jarrah and Marri trees. Naturally, plenty of wood craft is available in the town. With so much to see and do, the Karri Visitors Centre in the centre of the town is a good place to start. It houses a tourist centre, a pioneer museum, Karri Forest Discovery Centre, and the Pemberton Telecentre. Trout and marron fishing is popular in this area; there are local trout farms or guides and tuition as to catching trout in the wild can be arranged at the tourist centre. There are many national parks in the area worth having a look at. Gloucester National Park is famous for the Gloucester Tree, the highest lookout tree in the world; climb 153 rungs to reach the 60 metre platform. The tree was named after the Duke of Gloucester who visited during its construction in 1946. The park also contains the Cascades, a set of rapids meandering over rocks amongst the lush forest. Warren National Park offers walk trails, lookouts and camp sites by the river, as well as the Dave Evans Bicentennial Tree, another climbing tree. Beedelup Falls in the Beedelup National Park is another sight not to be missed, particularly if visiting during spring when surrounded by a carpet of wildflowers. The Yeargerup Dunes on the coast are great for 4-wheel driving and sightseeing in the process. 4-wheel drive tours are available, as well as camping areas on some area of the beach (double check with CALM). The Pemberton Tramway is also a major tourist attraction with a 1907 replica tram crossing rustic bridges, rivers and streams. You can even learn how to drive a steam train. There are also a number of wineries in Pemberton and the wines of the region are said to have the distinct and unusual taste of wines from Burgundy, France. A scenic 5 hour drive south from Perth will lead you to the city of Albany. Albany was given city status in 1998 and is one of the world's most beautiful harbours. It was the first European settlement in Western Australia. The city offers a number of festivals, exhibitions and fairs at various times of the year, and many historical attractions. Beautiful views of the coastline can be found at Torndirrup National Park, Jimmy Newell's Harbour, Salmon Holes, the Gap (a 24 metre drop to the seas) and the Natural Bridge. King and Kalgan Rivers are excellent for fishing and water sports. Middleton Beach and Ellen Cove are great swimming spots with white sand and gentle waves. Whale World museum was Australia's largest whaling station until it closed in 1978. It is the only museum to have been created from a working whaling station. There are plenty of restored buildings in Albany such as the Old Gaol, Patrick Taylor Cottage and the Old Post Office. The Princess Royal Fortress<, commissioned in 1893 to prevent the port from enemy attack, is now a popular tourist attraction as is the former Military Institute, now a visitor centre and tearoom. Augusta is a small coastal town about 3 and a half hours from Perth. It is most popular for its wildlife, displayed in the Leeuwin Naturaliste National Park and Hill View, and its water activities such as sailing, fishing, scuba diving, wind-surfing, water skiing, surfing, canoeing and whale-watching. There are about 350 limestone caves located in the town, five of which are open to the public on Caves Road. There is Ngilgi Cave, Mammoth Cave which features a self-guided CD headset tour, Lake Cave which also provides a centre for those who do not wish to actually enter the cave, Jewel Cave and Moondyne Cave. Cape Leeuwin, 9kms south of the town, is the most south-westerly point in Australia and where the Indian and Southern Oceans meet. The 100 year old plus Cape Leeuwin Lighthouse is found here. Bunbury is only 2 hours south of Perth, located on the coast. It is the regional capital of the South west, offering many water and sporting activities and is a great place to relax. Bunbury, as a seaside town, has many ocean-related sights and activities. At the Dolphin Discovery Centre< you can see Bottlenose dolphins in their natural habitat. There are over 100 dolphins in the bay and you can swim and snorkel alongside them. Dolphin cruises are also available. The Big Swamp is a fresh water bird sanctuary with a raised walkway which allows you to get close to these native creatures. Victoria Street offers a range of restaurants and cafes, and in the city centre you can find many old pubs such as the Wellington, Burlington and Rose Hotels. Not far from Bunbury is the town of Busselton, awarded Western Australia's Top Tourism Town in 1995 and 1996. It is famous for its beautiful white sandy beaches. The town's jetty, the longest in the Southern Hemisphere (2kms), is considered its most popular tourist attraction. It was built over 95 years from 1855 and you can walk across it or catch the Jetty Train. The Busselton Arts Council is located in the Old Courthouse where you can find a gallery, coffee shop and gift shop, as well as old gaol cells which are said to be haunted. Walpole, 418kms south of Perth, is the only place in the South West where the ocean meets the forest. It is an extremely scenic area, show-cased by the Walpole-Nornalup National Park. 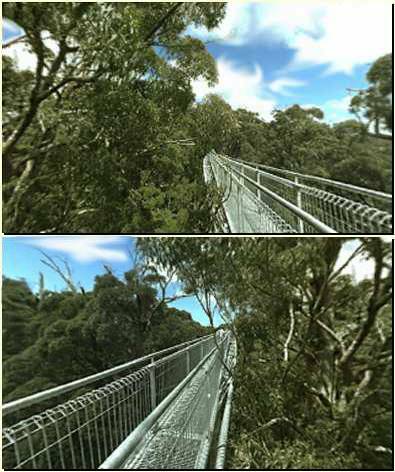 The area is best known for its Valley of the Giants- Tree Top Walk located in the Walpole-Nornalup National Park. There you can walk through the tops of the huge red and yellow tingle trees on suspended walkways. There is also a ground level walkway which winds through the forest. The tingle trees are the largest of the eucalypts and reach up to 60 metres tall with huge hollowed trunks of up to 20 metres in circumference. The park also has a gift shop where you can purchase unique souvenirs of your visit to the Valley of the Giants. Just nearby, in Denmark, there is the Giant Tingle Tree; a tree with the widest known girth of any tree in the world.